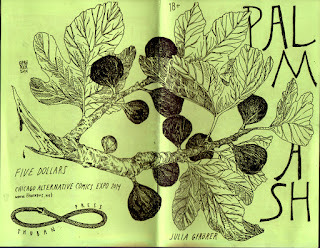 Palm Ash, by Julia Gfroerer. Gfroerer is a cartoonist who uses magic as a device to highlight the extremes of human emotions and interactions. Acts of extreme religious faith are indistinguishable enough from magic to certainly qualify for a similar level of scrutiny. Gfroerer has always said that the magical aspects of her comics were less important than what the people in them said and did, that they could be dismissed by a reader as fantasy or not real. In Palm Ash, the magic is entirely stripped away and all that's left are the characters and their actions. The story is set in Rome after the death of Christ and the rise of Christianity as a cult religion that was still punishable by death. To be a faithful zealot in that atmosphere required an incredible amount of conviction that bordered on insanity, a theme that Anders Nilsen explored in his book Rage of Poseidon. 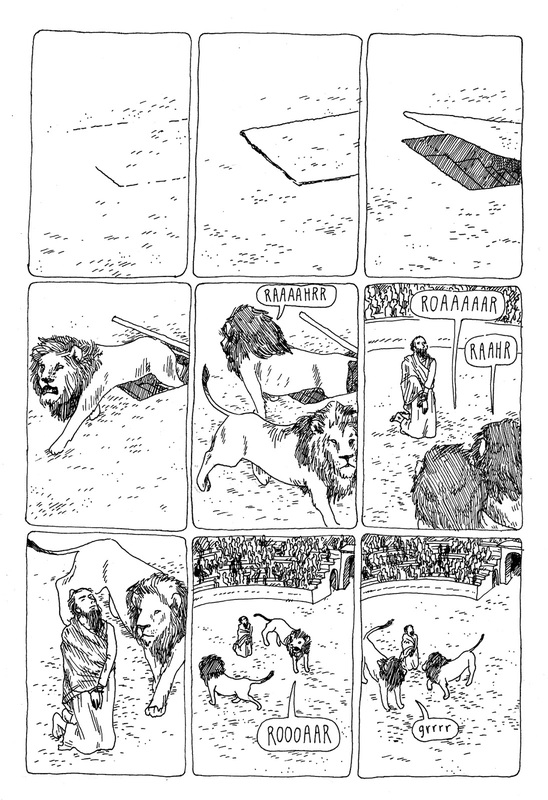 The story opens with a pit being opened and two lions emerging from it. A kneeling man, his hands bound and eyes closed, silently awaits them. Sizing them up, the lions start to purr and eventually lie down next to him. It's a genuine miracle, but Gfroerer depicts the man, named Simeon, with huge beads of sweat on his brow. He has faith in god, but it's not an arrogant or cocky faith. He's far from being Daniel in the lion's den, and as we learn later, certainly doesn't think of himself as a hero or martyr. He's there because he baptized people and wouldn't stop doing it, even at the risk of execution. His survival was witnessed by a slave named Dia, who burst into tears upon seeing him live. It's a silently transformative scene, because it simply affirms her own growing, now inescapable faith. Her story is interlocked with another slave whose aim it is to seduce one of the gladiators, as well as a citizen in the crowd who panics when he sees that his mistress has been thrown to the lions. Gfroerer threw in those details, as well as constant details regarding games and betting, to give the reader a sense of what human life was worth on a daily basis. The Roman Coliseum was the site of the original "society of the spectacle", one where the value of life was only worth as much as it would entertain the crowd and distract them from their own lives. The belief in a god that transcended, and indeed contradicted, the daily butchery and cruelty that passed for entertainment was undeniably threatening to the powers that be. You can't argue with or reason with a fanatic (in the most literal sense of the word), and that's why Simeon was willing to baptize Dia's son in secret. Violence against zealots only creates martyrs, as the history of the Catholic church demonstrates. 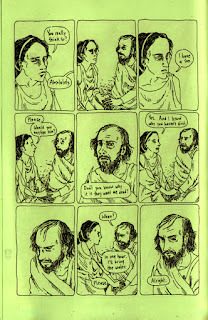 When things go awry in the story, there's a fascinating final page the reprises the opening page. We see things from Dia's point of view once again, this time as she crawls to the window with the "show" about to start, this time featuring both Simeon and her young son. The final panel might seem like a teaser at first, but it's one that leaves open the idea of another miracle or the inevitable death of a zealot. It's a tense, beautiful way to end this thoughtful storey that not only explores matters of faith, but also matters of class and gender as well in its twenty pages. Gfroerer's thin and scratchy line is astoundingly expressive. The way she draws her female characters, modulating emotion and expression with a simple raising of an eyebrow, as well as her slightly pathetic and even neurotic zealot, give the story a powerful sense of visceral authenticity. When she depicts violence, it is shocking and terrible, the way it should be. 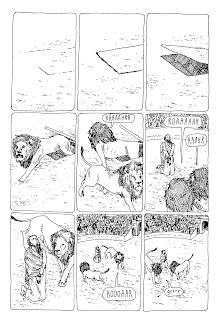 Working a nine-panel grid gives the story a strong sense of panel-to-panel rhythm, one unbroken by any circumstances. It's an unyielding view of a horrible world, one where acts of compassion are possible but likely to be harshly punished.